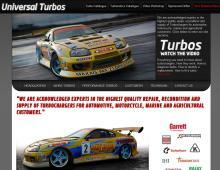 Universal Turbos are a renowned turbocharger repair and recondition company that operate in Hampshire. They also supply various turbochargers such as Hybrid turbos, roller bearing turbos and racing turbos which can be found in the on-site turbo and turbonetics catalogue. The website also has a video showing how turbos work, turbocharger diagnosis of faults and how to fit a turbocharger.